There are many unique gemstones in the world and we enjoy featuring them on our blog. 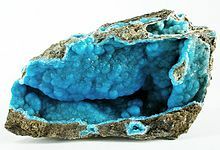 Here is some information about the Hemimorphite gemstone that you may want to know if you are looking at purchasing jewelry made from this unique gem. The Hemimorphite gemstone is mined from Australia, Algeria, Mexico, Namibia, Congo, Italy, United States and a few other countries. This mineral gemstone contains over 50% zinc in its mineral makeup which makes this an interesting stone. It is usually found in a turquiose blue color or deep green color when set in jewelry. Both colors are very desirable with gemstone and jewelry collections. This beautiful gemstone comes in at 5.0 on the Mohs hardness scale so it's not the greatest gemstone to use in rings because rings tend to get the most wear. If you are purchasing a ring with a Hemimorphite gemstone, it is best to be set in a bezel setting which will help to protect it. You will find mainly earrings, pendants and some bracelets out in the jewelry marketplace using this beautiful gemstone. Just like all of your other semi-precious gemstone jewelry, you do need to protect your Hemimorphite pieces from water, chemicals and extreme temperatures. When your pieces need to be cleaned, just wipe them down with a damp cotton cloth and towel dry. If they need a deeper cleaning, we recommend taking them to a professional jeweler. Since this gemstone is only a 5.0 on the Mohs hardness scale you want to store your pieces in a properly protected jewelry box or armoire and place them in a single layer with no other jewelry pieces laying on top of them. This will help to prevent damage to your pieces and ensure lifelong enjoyment of your prized jewelry.